Yeah, still bad but I think you get the idea. I'm not hip to the provenance of the tie-belt, but it's adorable on her and I also see this with rolled-up jean shorts and dresses....and is this not a good DIY project?! I'm not allowed to begin any more DIY projects as there are two baskets filled with unfinished DIY's in my apartment. I'm just too easily distracted (hey, Marianne, remember that sewing class we took 7 years ago? Yes, still working on that denim tote bag). 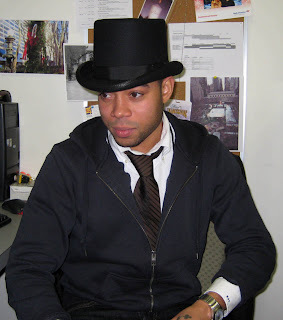 but generally without his New Year's Eve top hat. His brown striped tie is classic Tie World. $6 for the polyester wall and $12 for the silk wall. Not bad for a cheery belt, right? 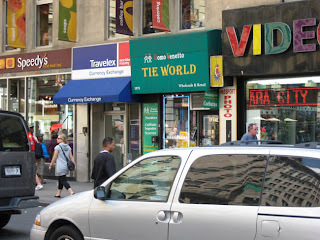 Small sign for a store named "Tie World," right? But look, cuff links! Stalking tie belts....very interesting behavior, missy. Let's see what you come up with for a tie-belt. Maybe you just buy a tie and tie it. No DIY required. I've done this. 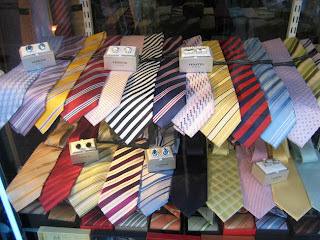 I love DIYing ties...one of the most impressive DIYs I've seen is a tie dress! 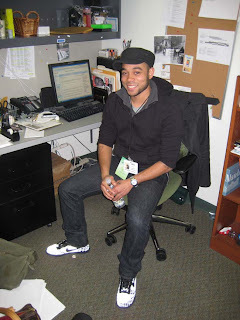 Cute co-worker, I love the sweatshirt and tie combo. you know, AIS, I wasn't going to say anything, but yes, he's way cute!